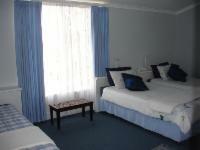 Three beds.Facilities in room include: Coffee/Tea; Telephone; TV; Hair dryer; Bar fridge; Heater and fan; Wall safe. If cancelling 0 day before arrival, forfeit 100% of the booking total. If cancelling 999 days before arrival, forfeit 100% of the deposit. Unless given notice on that day, we reserve the right to re-let bookings which are not taken up by 6pm on the booked day of arrival. Deposits are not refundable. A pro rata refund, excl. deposit, may be made where management has been able to re-let room.